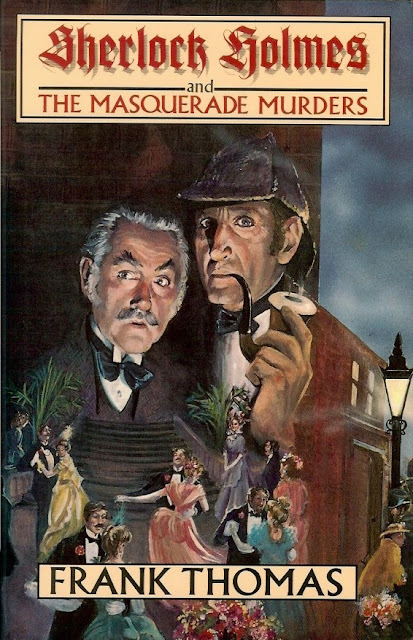 Another fine Holmes pastiche by Frank Thomas, this one with terrific cover art featuring the classic pairing of Basil Rathbone and Nigel Bruce. First published as a paperback in 1986, this hardcover edition was released in 1994. In a sea of blackness . . .
A bank appraiser, expert at identifying counterfeit papers, is discovered quite dead in London's financial district––but is it from natural causes or a cleverly disguised murder? Sherlock Holmes, ever the brilliant theorist, conducts his own brand of post-mortem as he leads Dr. Watson and a motley crew of confidence men on a precarious chase through the most notorious neighborhoods of London. One primrose path leads to another––from the mystifying futures market to the most sensational costume ball in many a season. Lives, fortunes and careers are the stakes in this deadly game . . . ad it's up to the master sleuth and the good doctor to unmask the cunning culprits before another corpse is found. Frank Thomas has adapted this adventure from the memories of the esteemed John H. Watson, M.D. The case has been selected precisely because it was the cause celebrate in its day, although a true account of this sensational case has never before been revealed. In a hardcover edition for the first time, Sherlock Holmes and the Masquerade Murders is now a matter of public record, confirming again the stature of the world's greatest consulting detective.